Trump and ISIS Like To Use Torture. Washington and Muhammad Did Not. Ladies and gentlemen, I present to you Donald Trump, the “going beyond torture” candidate for President. You may have read by now the official lie about [waterboarding], which is that it “simulates” the feeling of drowning. This is not the case. You feel that you are drowning because you are drowning—or, rather, being drowned, albeit slowly and under controlled conditions and at the mercy (or otherwise) of those who are applying the pressure. Our next potential President – the so-called leader of the “free world” and proponent of human rights – loves the idea of drowning people to death. This is disturbing. The media would never say it, but Trump is acting like ISIS. I can only imagine the number of Americans who support Trump’s call for torture. I do not have a precise number, but I can guess the number is high, too high, especially among Republicans. Trump and his supporters often rant about “keeping America safe” and “defending the homeland and our allies,” which (to be fair) is all good and fine, but who is to say that torture is in-line with “American values”? As Commander-in-Chief, Washington refused to lower himself to the wretched actions of his British enemies. He commanded Americans to behave with compassion and justice. It is a far, far cry from Trump, who would use torture with a sense of pride, like he was doing something enjoyable or heroic. Washington is rolling over in his grave. And how about Prophet Muhammad? Many Americans (Trump among them) likely associate Muhammad with violence, terrorism, intolerance, and other horrific things, but he, like Washington, rose above the barbarism of torture. 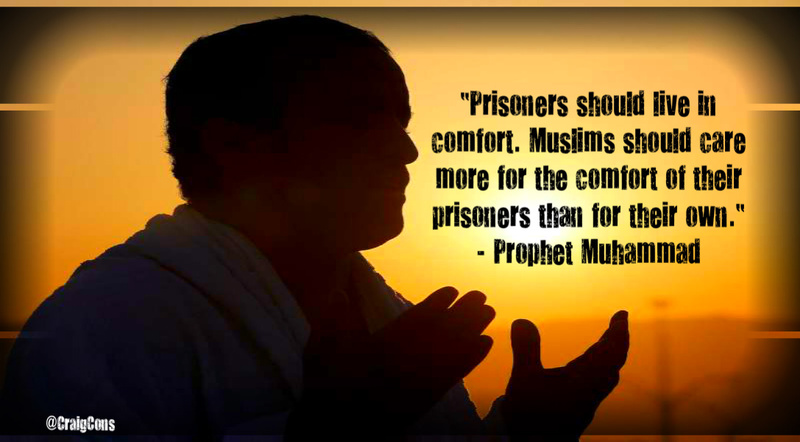 The Prophet of Islam stated: “Prisoners should live in comfort. Muslims should care more for the comfort of their prisoners than for their own.” The key word here is comfort. What a lovely term. According to Muhammad, members of the ummah, or Muslim nation, must rise above inhumanity, even in the most extreme cases like war. Muslims are never to lower their standards to that of their enemies. Just as Americans were told by Washington. Surely, this may sound crazy to many Americans, but it is true: Trump could learn a thing or two about humanity from the Prophet. Consider another passage from Muhammad: “If a Muslim commits the sin of ill-treating a prisoner of war, atonement is to be made by releasing the prisoner without ransom.” The Prophet was so insistent on treating prisoners of war with respect and dignity that he demanded Muslims to treat them as they would want to be treated. You see, Muhammad was a follower and believer in Jesus Christ, who centuries earlier called on Christians to “Love your enemies, bless them that curse you, do good to them that hate you.” Ironically, Trump calls himself a “Christian,” even though he loves cruelty far too much for anybody to take his “Christian identity” seriously. Trump wants to use torture. ISIS already uses torture. Washington did not want to use torture. Neither did Prophet Muhammad. Trump is like ISIS, and vice versa. Washington is like Muhammad, and vice versa. Previous Post Muslims Aren’t A Race, So I Can’t Be Racist. Right? Wrong. This is very a strange way of assessing Mohammed’s attitude to torture. On the one hand Dr Considine quotes two supposed passages to show Mohammed’s refusal to use torture. Where are they from? We don’t know as he gives no references so we cannot check them out. Why on earth does Dr Considine do this? Who is he attempting to deceive, us or himself? The short time that I’ve heard of Craig Considine and read his articles, there is a lot of questionable information, which he regards as facts. These are his “own” opinions and he should say so. He hides behind his degrees and teaches and preaches leftists ideology. Basic purpose of Mohammed, Jesus , Moses, Solomon was to bring mankind to one nation who follows divine code of conduct, they never came to kill or destroy world , there first attempt was dialogue to preach their message as they were assigned by God to guide human beings, when mankind was not scientific nor philosophical like us in this age . You can not argue against the will and wisdom of God or prophets, we lack knowledge and acumen to comprehend the whole gamut. Dr c is proponent of Divine will from all ecclesiastical sources he is right in his inferences .